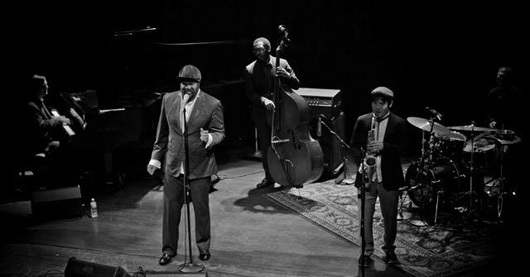 Last sunday, I had the pleasure of seeing the incredibly talented Gregory Porter live. He was the main act at a small - but amazing - jazz festival nearby and it was truly magical. I go there every year, even when there aren't any big names on (although usually there are) because the setting alone makes it totally worth visiting. It's on a small square, tucked away behind a big church and an old abbey, with some trees standing here and there. It's always a pleasure to walk across the square, or have a drink at the bordering jazzcafé, but when they organize an event there it's extra dreamy because they cover the trees in hundreds of tiny white lights. Sounds super cheesy, I know, but when you get in the right mood the whole thing can be incredibly romantic. And some live jazz music is just the thing to put you in the right mood. Gregory Porter is a brilliant singer and songwriter, and the musicians he brought to accompany him were equally fantastic. His songs were a beautiful mix of soul and jazz and the anecdotes and jokes shared between songs made the whole evening very enjoyable, dispite the freezing cold. And the musicians! I have to say it again, they were incredible. Solo after solo hit us, without it ever becoming tiring. Chip Crawford on piano, Aaron James on bass, Emanuel Harrold on drums and Yosuke Sato on alto sax. I don't wanna play favorites, but hearing Sato play was pretty special. All of these names are worth remembering though, and it seemed like they had been playing together all their lives. If you have a chance to see these men live, don't hesitate. If not, get the album. I found it at my favorite music shop this morning and it's been on repeat all afternoon. As the New York Times put it, Gregory Porter has most of what you want in a jazz singer, and maybe a thing or two that you didn't know you wanted. 1. Be Good is the first track on the new album. The video confused me a little, and the lyrics too, to be honest, but the music and Porters enchanting voice totally make you forget about that. 2. Real Good Hands on the other hand, has the loveliest lyrics. Plus, it was nominated for Best Traditional R&B Performance.If you're planning on proposing to your partner-in-love, give this a listen. 3. Imitation of Life was my personal favorite. Soft and slow, the kind of song that can move you if you let it.